This shape is best suited for kitchens that are big and roomy and whose outline is in shape of an L. One side of the area can be used as work space and the other for dining. The small section of the L can be the extension of your counter, minus the cabinets that may block the view. The other side of L that is the bigger side can be converted into your kitchen bar with 2 to 4 bar stools or chairs. The storage can be created in base cabinets. 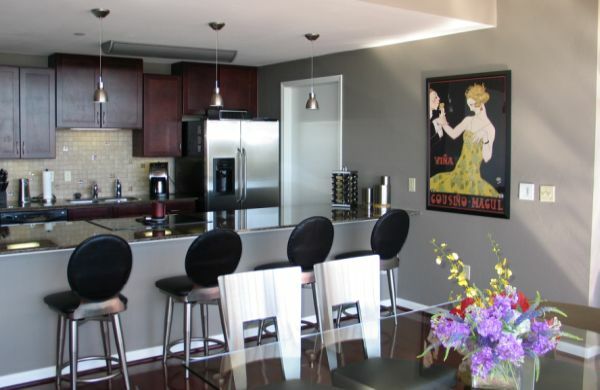 This is a modern way to include a kitchen bar yet not have your kitchen on display all the time. You can make a dividing pass from your kitchen to your dining room thorough the wall. You can also add sliding doors if you like. This kitchen bar is simple yet convenient especially for your buffets. Adding a drop down table is a simple and fun way to make your kitchen look funkier. It can be added to your existing bar. With the help of metal brackets you can attach the counter top to the back of the bar. You can adjust the height the height according to your need. To make it friendlier for your kids you can keep it low. This is easy too. Use the existing island in your kitchen area to make a small bar. Extend it towards one side and it can be a great dining area for your kids to eat snack and breakfast as you work in the kitchen. By extending the counter top you will also increase your work space. To give it funky look add a few fresh and cool chairs or stools. It is an amazing idea if you don’t already have a kitchen bar. It is portable and you can move it in and around the kitchen and will also help you during the cooking and then double up as dining area later on. a. Lighting: Overhead lighting is a very important factor in your kitchen bar. It gives it an artistic and sleek modern look. b. Top material: The material you choose for your bar top is important too. It should be attractive and functional. c. Draft system: If you love to have beer it is very convenient to have a draft system in your own kitchen. ← Where will I find a really whacky kitchen towel holder?